As their name suggests, Venezia Lines sails primarily from the Italian port of Venice, while services have, in the past, run from Rimini and Bari. 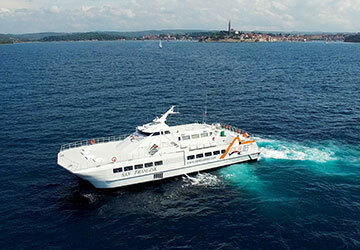 Operating their first trip in 2003, Venezia Lines is now a leading company in the Adriatic Sea thanks to the backing of Virtu Ferries; they have since carried over a million passengers between Venice and the northern coasts of Croatia and Slovenia. Running from April to October, Venezia Lines can carry around 300 passengers per trip, and with crossing durations of between 2 ½ and 4 hours, depending on the route, they are by far the fastest carrier linking the North Adriatic's ports, averaging a speed of about 35 knots. The 2 ships are air-cushion vessels called San Frangisk and San Pawl, combining all the advantages of hover crafts and catamarans, resulting in higher speeds, lower fuel consumption, less wave-making and higher manoeuvrability owing to the significant reduction of water resistance. 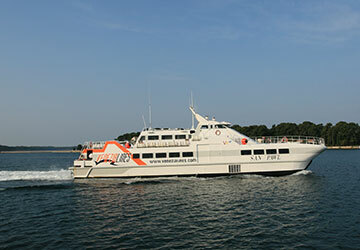 Use directferries.com to find Venezia Lines timetables, prices and to book Venezia Lines ferry tickets. Looking for the lowest fares for your destination? Don’t worry, we’ll also compare Venezia Lines with alternative ferry companies. Booked this trip from the UK before I went to Croatia and paid £119 for two adults, it was a bit of a gamble doing it this way as the boat doesn't sail if the weather is bad, thankfully it worked out for us on the day but the excursion the day before was cancelled so bad weather could mess with your plans. Just as the boat left the port in Porec one of the crew went round handing out sick bags, this was an omen of things to come. The high speed catamaran gets very rough and bumpy even in the mildest of waves so a few of the fellow passengers were sick, these conditions also made it rather difficult to walk around to go to the toilet or the on board bar, we stayed in our seat for the entire journey. The staff on board were selling a package for 80 euros ppn which consisted of transfers, lunch, guided tour etc but I had been advised before I travelled that I could do all these things cheaper, this turned out to be true so I'm glad I didn't take up this offer. All in all if your going to Croatia this is a fantastic opportunity to visit one of the most beautiful cities in the world, I'd recommend this to anyone who's not adverse to having their internal organs pounded a bit during the crossing.